With temperatures in the mid 90s for the opening weekend of the Tennessee bow season, I decided that it was just too hot to hunt. I must be getting old... That didn't keep me out of the woods, however. After spending a couple hours on Saturday morning talking about pursuit-style hunting with Rambuck and Doug Markham on the Outdoors with Doug Markham radio show, I decided to put in some serious scouting time on a terrific piece of hunting land in the middle Tennessee area. OK, maybe I'm not that old. First, the good news. 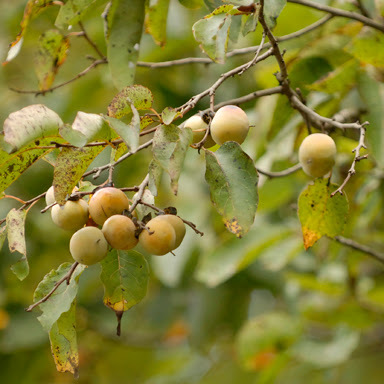 I found many red oaks with good quantities of acorns, and several fruit-bearing persimmons. None of the mast was ripe yet, so none were dominant trees. I've noted the location of the trees on my topo map and will keep an eye on them as the season progresses. There are certainly some future dominant trees in the bunch. I did find exactly two chinkapin oak acorns - the first and only acorns from the white oak family that I've found so far this year. I just happened to glance up and see them. I also found the first four rubs of the season. Now the bad news. 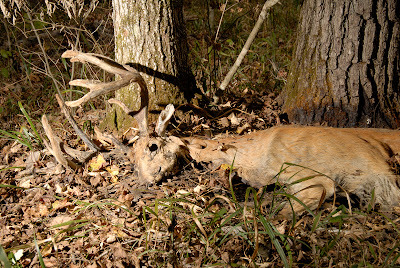 Middle and West Tennessee deer are experiencing a severe outbreak of Epizootic Hemorrhagic Disease or EHD. EHD is caused by a virus that is transmitted to deer by small biting insects called midges or no-seeums. Deer infected with EHD develop sores and severe swelling in their mouths, making eating and drinking difficult. 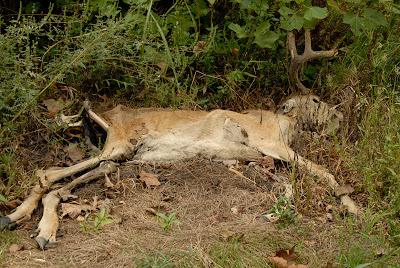 According to the Tennessee Wildlife Resources Agency, EHD is a common disease among deer but poses no risk to humans. It does, however, typically kill about a third of the deer that contract it. The TWRA has produced a very good informational podcast about the disease. Click here to view it. Sadly, I found two terrific bucks that fell victim to the disease. The first was a tall-racked eight pointer that would probably score in the 120's. The second was a very nice ten pointer that definitely would have made Pope and Young. Late 2007 Update: Reports from the Tennessee Wildlife Resources Agency were that over half the deer population in certain parts of middle Tennessee were lost to EHD. The photo above shows the cracked hooves of a buck that I killed during muzzle loader season. He was limping noticeably as he approached, so I assumed he had been injured. I wasn't until I field dressed him that I discovered he was uninjured except for the cracked hooves. I discovered later that this is typical of deer that survive an EHD infection. The deer you killed with cracked hooves from EHD...did you eat it still? I did. I was told by a TWRA biologist that the meat was safe to eat. Hi, thanks for this post. I just moved to middle TN. Do you know if EHD is still a big issue? Thanks! John, EHD is always present in the deer herd, but it seldom reaches epidemic proportions like it did on 2007. Usually there are just small isolated outbreaks.